Members of Missouri’s Human Trafficking Task Force say their mission is to raise awareness of the trafficking problem in the Show-Me State. Lawmakers who serve on the task force describe the issue as a “rapidly-growing” criminal industry. The Human Trafficking Task Force meets Wednesday afternoon at 1 at Mehlville High School, near St. Louis. 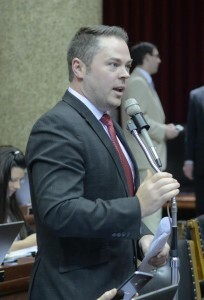 State Rep. Elijah Haahr (R-Springfield) chairs the task force. “And our goal is just to be there, whoever wants to come testify, to provide us with information and give us their input on what we need to do as a Legislature, what the state of Missouri needs to do in order to move forward on this issue,” Haahr says. Haahr tells Missourinet they aim to get input from three different perspectives. One is from law enforcement. “Two, people that helped bring the victims out of trafficking and what things they need from the state of Missouri. And then three, the traffic victims themselves,” Haahr says. “So these hearings outside of our legislative session give us that opportunity to really refine the pitch that we need, the legislation that we want to offer and to maximize whatever time we’re spending during the legislative session on it,” Haahr says. He describes the task force work as bipartisan, noting he’s worked closely on the issue with Senate Democratic Leader Gina Walsh (D-Bellefontaine Neighbors). Haahr has also worked closely with State Sen. Bob Onder (R-Lake St. Louis) and State Rep. Cloria Brown (R-St. Louis County). Haahr describes Brown as “important part of this Committee”, saying she’s pushed to get perspective from south St. Louis County. Brown’s district includes the Mehlville area. Senator Walsh tells Missourinet she agrees with Haahr that the task force work is bipartisan. The task force held hearings last year in St. Louis, Kansas City and Springfield. They’ll hold another hearing later this month in Columbia.